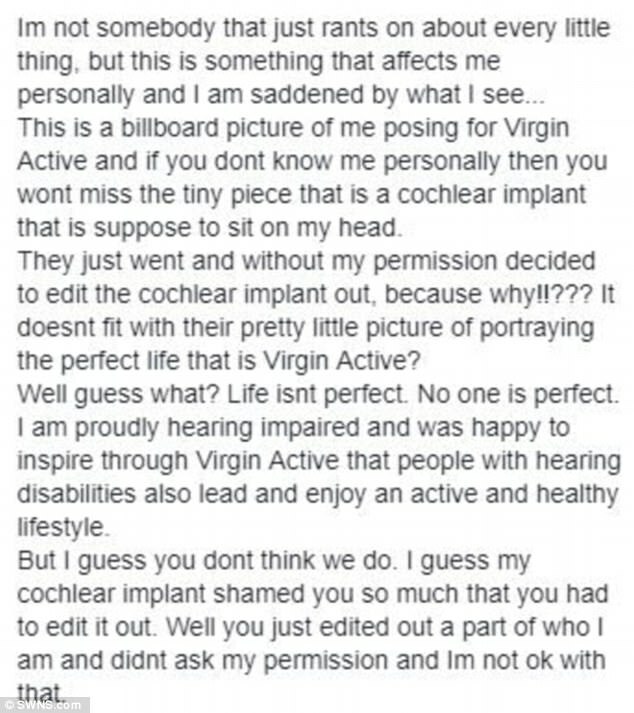 An award-winning deaf dancer has blasted global health club Virgin Active for editing out her hearing implant in a worldwide internet advert. Simone Botha Welgemoed, 27, was 22-months-old when it is thought she became the youngest child in Africa to be fitted with a Cochlear implant in 1992. 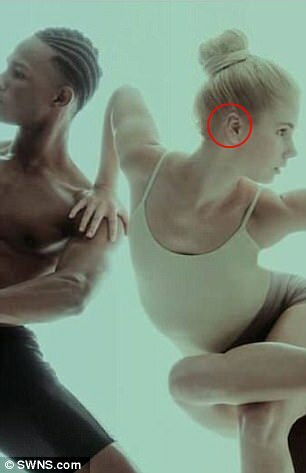 But after being picked to model in the advert for Virgin Active, she was shocked to see the implant had been photo-shopped from her right ear. Simone, who was crowned Miss Deaf South Africa in 2012, said: "I was shockingly surprised and it felt like somebody just dropped a bucket of water on me. "I couldn't believe what I saw when my sister tagged me in the Virgin advertisement on Instagram, I couldn't believe what I saw. "I was born profoundly deaf and received my CI (Cochlear implant) at the age of 22 months. "At that stage I was the youngest child in Africa to receive it, without my CI I hear absolutely nothing at all." Simone, who has been deaf since birth, immediately contacted Virgin after spotting the error on social media in September. Simone wears her cochlear implant across the back of her head, meaning that her speech processor sits above her left ear, and the implant itself fits behind her right ear. 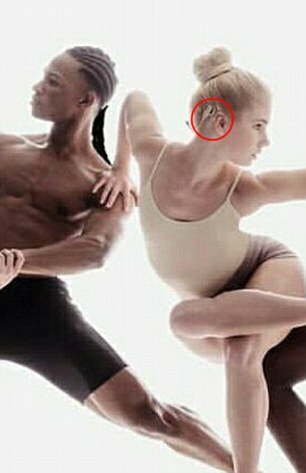 Virgin's advertising campaign does not feature the wire or implant that Simone was wearing when they shot the advertising campaign. She has accused them of choosing aesthetics over reality - despite them being aware of her disability when she was chosen for the ad. The company, founded by Sir Richard Branson, immediately pulled the edited version and replaced it with an earlier take which shows the implant. Simone said: "Virgin Active immediately responded to my post on Facebook and made contact with me to meet with them. "We had a discussion about what happened and they were extremely apologetic about everything. "Somebody on the creative team, probably uneducated about hearing disability if I can say so, told them to remove it. "Unfortunately nobody thought the better of it and that the impact of the bigger picture would be an unwelcome one. "Virgin took off all the adverts and put the original one back on." Simone has previously modelled for Virgin in their 'Ballet Barre' series, when the firm learned she was hearing impaired. However, she still appeared on billboards in images which featured her implant. Simone, principal dancer with Bovim Ballet Co. in South Africa, is also an active representative for the deaf community. She hopes to use her experience to raise awareness of the hearing disability. Simone said: "It's amazing how many people still need to know more and that there is still work for me to do as an ambassador and former Miss Deaf SA. "I was put in a difficult situation. If I claim to be an ambassador for the deaf, then am I not proud to boldly showcase who I am? "I am also currently working on a solo performance for a big international event in Austria next year where I will represent as the world's first professional ballerina with a cochlear implant. "I believe that your imperfections add to your beauty and uniqueness as a human being. "I was born deaf and my disability as shaped me in who I am today. "Not for one moment would I hope to try and change myself, because I was meant to find my purpose in life with it and so I do it with hard work, many obstacles and and yet with joy, grace and beauty. "So I choose to smile on and make my disability an ability." Liam Preston, head of the body confidence campaign Be Real, said: "It's important for companies to be inclusive of diversity in their advertising and portray people from all walks of life. "While there are nowhere near enough disabled people featured in advertising as it is, editing a model's cochlear implant, which is part of her identify, suggests that only a certain look is desirable. "Instead of companies trying so hard to portray only one beauty standard, there should be more emphasis on highlighting and celebrating people's uniqueness." Dr Jan Sheldon, Chief Executive of the Royal Association for Deaf, people said: "The Deaf Community are very proud of their history, language and culture. "Although we acknowledge that Virgin have apologised for their actions it is clear that they have a very urgent need to significantly develop their knowledge and understanding of Deafness." A spokesman for Virgin said: "We issued an immediate apology to Simone. "We had a good heart-to-heart meeting with her. "We will work with Simone around education and have re-run the campaign, unretouched. "We 100% accept that the action of photo-shopping the image is not in line with our values as a business, nor in keeping with the welcome we extend to everyone. "Simone subsequently posted about her satisfaction with the resolution on her Facebook page. "We got it wrong and we realise that."